The swimming pool will be closed from 10th July for 3 Weeks. The committee has decided that in this extraordinary situation the club will suspend training fees for July. Swimmers (& parents) who do not wish to pay training fees in July should ensure that standing orders, transfers etc do not take place for that month. Any fees paid for July cannot be refunded – please stop your payment before it happens. Over the past years changes in squad times have not been followed through with proportionate training fee adjustments. 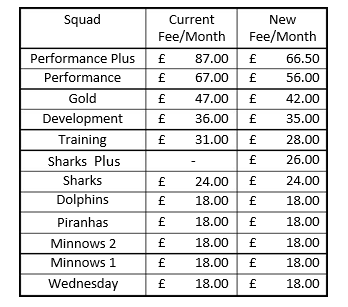 Senior Squad training fees are now being aligned to ensure all squad members pay a standard rate per swim hour. At the same time we have realised that there is scope to pass on savings occurring through the club no longer funding a paid Head Coach. By cuparswimming in Uncategorized on 23/06/2017 .